Last week was chock full of news on the youth sports safety front. Nocsae decertified  two men's lacrosse helmets, and I fielded some troubling emails about child sports safety advocates who allegedly spend their time monitoring social media, especially Twitter, for reports of youth sports injuries to take to plaintiffs' personal injury lawyers. 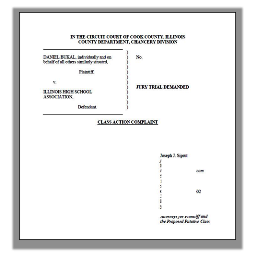 But, speaking of lawsuits, the big sports safety news of the week - at least in the media's eyes - was the filing of a class action  in Illinois state court claiming that the Illinois High School Association (IHSA) was negligent in failing to institute what the 52-page Complaint contends are best practices in educating parents and athletes about the dangers of sport-related concussions and repetitive head trauma, and in the identification and management of head injuries by high schools in the state. I had a chance to read the complaint today and while I agree with many of the goals of the lawsuit (MomsTeam has been a consistent and vocal advocate for having a certified athletic trainer at every high school , for instance), I will leave the job of deconstructing the plaintiff's Complaint to Donald Collins, one of our longtime experts (for Don's thought provoking article on the lawsuit, click here ) I do want, however, to comment more generally on whether litigation is the best means to the end of keeping kids safe playing contact and collision sports. If the IHSA class action lawsuit makes one thing clear for those of us, including many of the incredibly dedicated health care professionals and educators on MomsTEAM Institute's Board of Advisors , BODs, staff and expert panel, who spend our days working to protect children in sports through education, advocacy and research (something I have been doing for the past 15 years at MomsTEAM, and for a quarter century, if I count my time working to improve sports safety as an activist ), it is that we need to redouble our efforts to accomplish change pro-actively through adoption of best health and safety practices in every community, at every level of sport, in this country. Instead of attacking football for what hasn't been done to make it safe (in some cases, because it is such attacks which boost their notoriety and thus generate donations for their non-profits), we have tried, not just with the release of our PBS documentary, "The Smartest Team: Making High School Football Safer,"  but in all the years before and since, to highlight all the ways in which the safety of athletes has been improved. (In doing so, of course, we are in no way excusing those who have acted in a grossly negligent manner so as to cause actual injury to individual athletes. The remedy for those athletes and their families still lies in individual - or, in the case of former NFL players, class - tort actions for damages). Indeed, it is building a grass roots movement based on this model that is at the very heart of our SmartTeamsTM program . As the acknowledged pioneer in youth sports concussion education, and as the trusted source for objective, well-researched youths sports safety information, literally for the entire span of the 21st century, we at MomsTEAM have been privileged to witness and report on remarkable and positive changes in sports concussion safety, from increased awareness on the part of parents, athletes, and coaches about the dangers of concussions and repetitive head impacts (RHI), from an exponential increase in our understanding of the effect of concussions and RHI on the developing brain which have resulted in a growing movement to set limits on the number of full-contact football practices, from Pop Warner to the NFL, to research showing the important role neck strengthening  may play in reducing concussion risk, from the use of baseline and post-concussion neurocognitive, balance, and visual testing to gauge an athlete's readiness to return to play to the use of sensors  to improve the chronically low rate at which concussions are identified on the sports sideline. With few exceptions, long gone, thankfully, are the days when athletes were routinely allowed to return to competition the same day  if their concussion symptoms cleared in a few minutes after injury (thereby exposing them to increased risk of delayed recovery, permanent brain damage, and even catastrophic injury or death). No longer is the seriousness of the injury measured using a cookie-cutter approach which arbitrarily assigned a "grade" to the concussion  depending on whether an athlete lost consciousness (which research has long since showed is not a marker for a more serious concussion  and, in any event, is only present 5 to 10% of the time). The same kind of rigid approach to return to play, which depended on the number and grade of previous concussions, has been replaced by an individualized return to play protocol requiring an athlete to not only be asymptomatic, to be off all academic accommodations, and to return to baseline on neurocognitive, balance, and vision tests, but to successfully complete an exercise program of gradually increased intensity  without concussion symptoms. Do we have a lot of work yet to do? Absolutely. Is there a role for litigation in making sports safer? Certainly, just as there is a role for legislation, as was accomplished in the space of four years with the enactment of concussion safety laws  in nearly every state.